"The trumpets added zest to the fortissimo flourish of the coda." Southwell Minster, 11th March 2017. 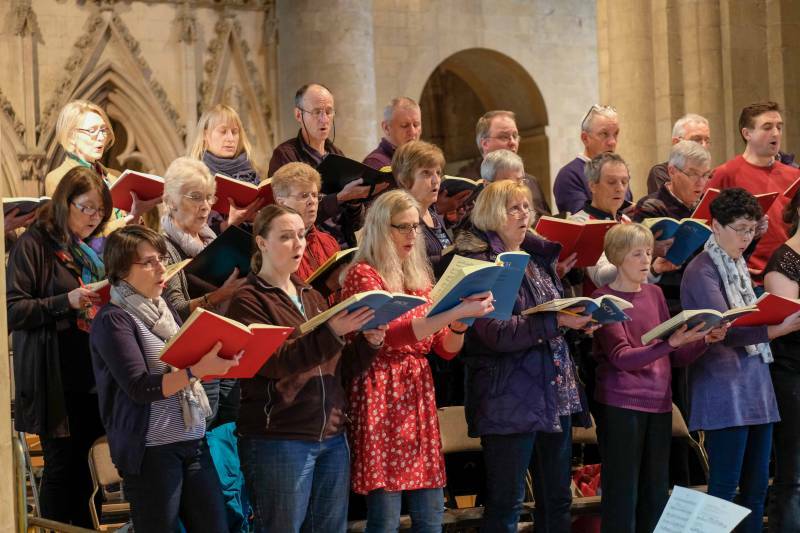 The Sinfonia Chorale’s 50th Anniversary season concert opened with a prayer of thanksgiving given by the Dean of Southwell, the Very Reverend Nicola Sullivan. She blessed all present and described music as a remarkable communication medium, with the power to touch hearts and uplift the soul. The Dean addressed a substantial audience with an estimated 250 strong gathering. The initial prayer aptly introduced Bach’s Mass in B Minor with a reverent note. The text, sung in Latin, is the Catholic Eucharist, or Holy Communion service. A deeply reverent script which, although a personal and individual petition to God, was here, performed in a concert setting, with full Baroque orchestra. It was simultaneously an intimate yet public experience. The exceptional aural experience was glorious in its diversity of vocal and instrumental colours! The splendid Baroque Orchestra for the event included a full basso continuo with harpsichord, organ, cello, double bass and bassoons (providing the bass line, section pulse, plus harmonic foundation). There was the usual assortment of strings, first and second violins with violas, together with tonic and dominant kettledrums, accurately and dynamically performed. The woodwind section included two wooden flutes, (which contributed a more delicate resonance) an oboe, cor anglais and bassoons, which added authentic mellow tones. 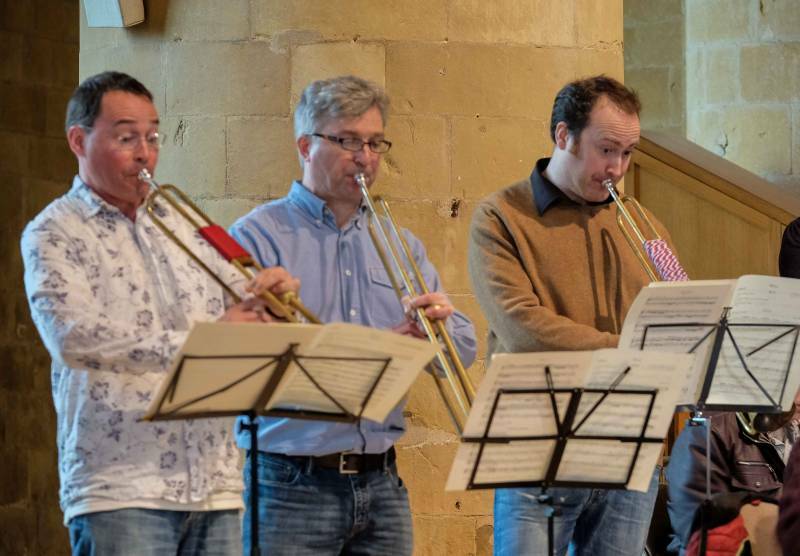 The glittering brass section with three valveless trumpets and a period French horn completed the vibrant tonal spectrum of the 18th century orchestral sound. With a grasp of the potency of the Latin communion script, it is possible to appreciate Bach’s masterful fusion of text, melodic line, tempo, harmonic progression, vocal and instrumental colour and dynamics. The mass contains many exemplary examples of ‘word painting,’ where the music composed, directly reflects the meaning of the text. A striking example occurs at the end of the Crucifixus section to the words, passus et sepultus est, (died and was buried) where all four vocal parts descend quietly to their to lower registers in long, solemn minim beats, to a hushed continuo and string accompaniment. The key is a suitably mournful, G minor. After a moment’s silence, the choir, now in 5 parts, bursts forth with energetic, ascending arpeggio figures, Et resurrexit (and rose again)! The key is now a triumphant and dynamic, D major and the full orchestra plus brass and timpani punch out a new Vivace, three crotchet in a bar tempo. This is arguably the most dramatic example of word painting in the entire mass. With the inclusion of the soloists, the B Minor Mass presents the full vocal spectrum, ranging from solo voice plus selected orchestration, to double choir accompanied by the full instrumental ensemble. 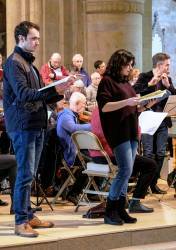 The soprano soloist, Lisa Cassidy sang the embroidered melodies of the Laudamus te, benedicimus te, (we praise Thee, we bless Thee) gracefully above the strings and continuo. Scored for Baroque horn, bassoon and lower continuo instruments, the Quoniam tu solus Sanctus, (For only Thou art holy) presents a complete contrast in instrumental timbre. Accompanied by this dignified, darker tonal colour, the bass, Michael Dewis performed the solo with flawless breath control. With notable lyricism, the Counter Tenor William Purefoy sang the the Qui sedes ad dextram Patris (Thou that sittest at the right hand of the Father), accurately above the cor anglais. The Gratias agimus tibi movement (we give thanks to Thee for Thy great glory), another intricate fugue in 4 parts, heralds the charming Domine Deus, Rex coelestis, (O Lord God, heavenly King,) soprano and tenor duet. 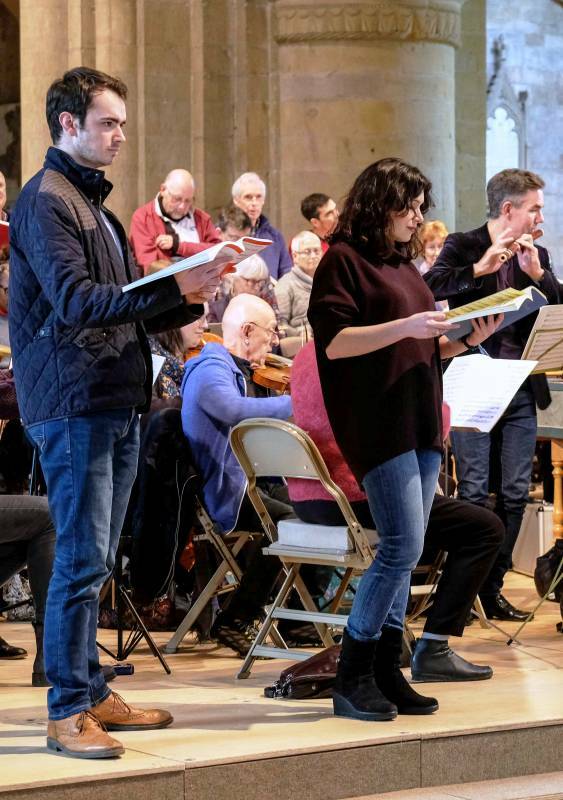 The tenor James Gallimore, together with soprano Lisa Cassidy performed the intricate and interweaving duet to great effect above the beautiful tone of the wooden flute. The composer’s incomparable musical dexterity is revealed in the Osanna in excelsis section (Hosanna in the highest), which is written for double choir and orchestra. With the choir divided, each choral block punctuates and answers the other, singing alternate phrases, then uniting for the climactic concluding phrases. The antiphonal interaction symbolises throngs of angels singing praises on high, yet there is still space in the texture for instrumental interludes. The trumpets add zest to the fortissimo flourish of the coda. In a composition as grand and intricate as this, these are but a few examples of musical expertise, artistry and virtuosity. 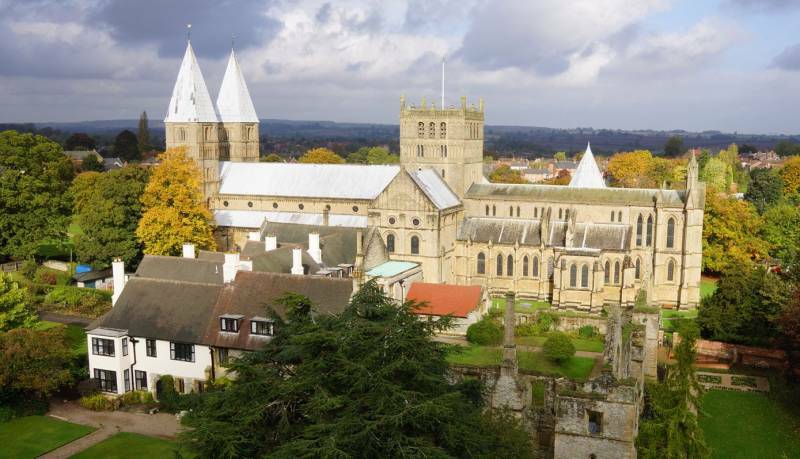 The magnificent and monumental venue of Southwell Minster is an extraordinary location for a concert or act of worship. Its official title is The Cathedral and Parish Church of the Blessed Virgin Mary of Southwell. The label ‘Minster’ denotes the largest and most significant church in an area (here, the southern part of the Diocese of York). Established as a site of Christian worship for over 1000 years, the Minster is an architectural gem. With its cathedral dimensions, it is an acoustic and visual delight to perform in and attend a musical event. 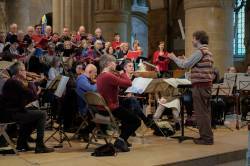 Whether received as entertainment or a sacred ritual, the 50th anniversary season concert at Southwell Minster was an occasion to remember! The Choir rose to the challenge of Bach’s taxing vocal scoring, performing to a high standard. 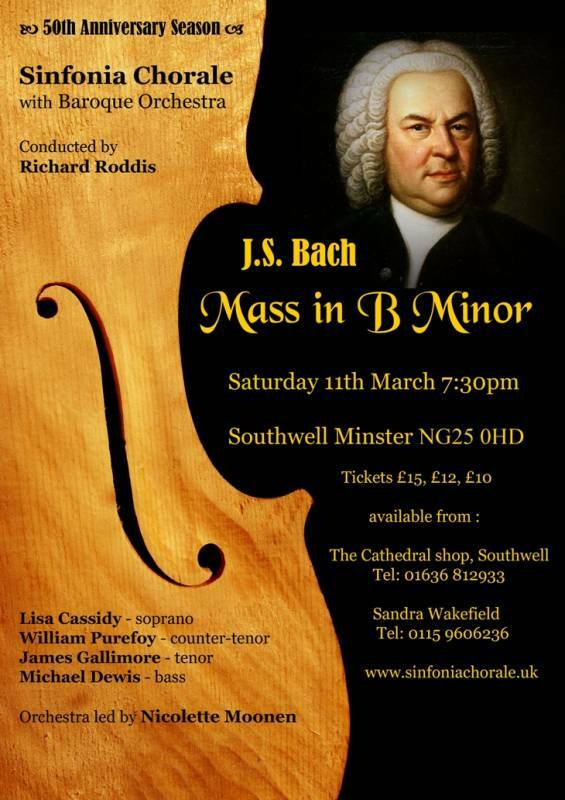 The traditional Baroque instruments augmented the delivery of the superlative piece and the Minster provided the gravitas and enchantment of a sacred setting. When the core components of text, music, quality delivery and location are outstanding, an occasion to be treasured is produced.